The Health Education Bureau organized a ‘train the trainer’ program for Food and Drug Inspectors, Health Education officers and Senior PHIs. 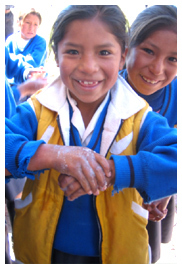 On 15th of October, 1,500 PHI visited 1,500 schools and reached 1 million school children, demonstrating how handwashing should be done. This activity helped disseminate the message to a record number of school children. A poster and a flip chart were developed to demonstrate 9 the steps of handwashing, based on surgical technique and were displayed in places like hospitals, plantation sector clinics, child development centers and health clinics. The promotional activities continued in the following week, during Sri Lanka’s Food Safety week from 20th – 26th October. TV advertorials were broadcast and print advertorials were published. A press conference was carried out to talk about the importance of handwashing and highlight the Global Handwashing Day activities.